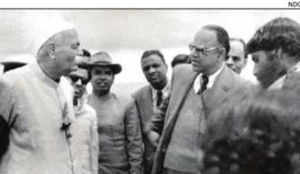 A 1958 picture sourced from the Nilgiris Documentation Centre (NDC) shows V S Krishnasamy, chief conservator of forests, in conversation with the then Union home minister Pundit G B Pant in Ooty. UDHAGAMANDALAM: Officers wearing shades and casual clothes while greeting PM Narendra Modi during his visit to Naxal-affected areas last month might have kicked up a controversy with the Chhattisgarh government hauling up two IAS officers for their “unbecoming behaviour”. But, five decades ago, such attire was considered cool. A 1958 picture sourced from the Nilgiris Documentation Centre (NDC) shows V S Krishnasamy, chief conservator of forests, in conversation with the then Union home minister Pundit G B Pant in Ooty. C Subramaniam, a state minister then, is seen next to Pundit Pant wearing sunglasses. The then district collector K J Somasundaram is seen wearing a hat. The picture was shot on June 2, 1958 against the backdrop of the picturesque Doddabetta peak in the Nilgiris. Now, this might seem to defy convention as even in today’s casual culture, men and women remove their hats as a sign of respect. Pundit Pant had visited Ooty then in connection with a conference. There were mixed reactions from retired bureaucrats in Tamil Nadu on the question of dress code and formality in attire. But they all agree that a written warning to the IAS officers in Chhattisgarh was taking things a bit far. “An IAS officer wearing a hat while meeting a Union minister is time dependant,” said retired DGP S P Mathur. “The code of formal attire is dependant on time and circumstances. The formal attire during the British era was entirely different from now,” said Mathur, pointing out that Bastar district magistrate Amit Kataria could have been just advised to dress formally. NDC director Dharmalingam Venugopal said the warning issued to the IAS officer in Chhattisgarh should ideally be an affront to the PM, who has been decrying the VIP culture. “The British had always insisted that bureaucrats should be dressed in formal attire and it was the ‘neta’ culture after independence which brought in an unwritten rule that ‘subordinates’ should not be “over-dressed” when compared to their higher-ups, he said. A file photo of Bastar collector Amit Kataria, who has been pulled up by Chhattisgarh govt for receiving PM in striped shirt and shades. RAIPUR: As controversy spiralled over Bastar collector Amit Kataria’s welcoming Prime Minister Narendra Modi during his recent visit to Chhattisgarh in striped shirt and shades, the IAS officer defended himself on social networking sites saying a formal suit or a ‘bandhgala’ at sweltering 40 degrees was impractical. Kataria remained incommunicado to the media, but he sent WhatsApp messages to a group of senior IAS and IPS officers “clarifying” his position. “Bastar is very hot in May with temperatures above 40. Wearing bandhgala for hours while looking after arrangements is not practical. I was dressed in complete formal dress, blue shirt, black trousers, black leather shoes (not t-shirt or chappals, and blue is a good colour in formal shirts),” Kataria wrote. In a message to TOI, however, Kataria denied sending the message. But, officers in his WhatsApp group confirmed he had clarified his position. The message, a copy of which was forwarded to this correspondent by a source, blames the media for sparking a controversy. Nonetheless, the episode does appear to have split the bureaucracy with many criticizing Kataria as well. Justifying his decision not to follow the formal dress code, Kataria said, “Governor, CM, CS, DGP came from the circuit house properly dressed and received the PM before me. I was standing and managing for them for many hours in the hot sun and was sweating and my eyes were burning. I decided not to wear the coat which I had put in my car.” He also said chief minister Raman Singh was not bothered about such trifling. “I have put 11 years of service and have done three districts, but if I am still naive and foolish, the UPSC and the Academy need to be blamed,” he further wrote.